Ok I am almost embarrassed to admit this but the desk I started in September is still not yet finished. Oh it has functioned perfectly as a desk since then, don’t get me wrong. 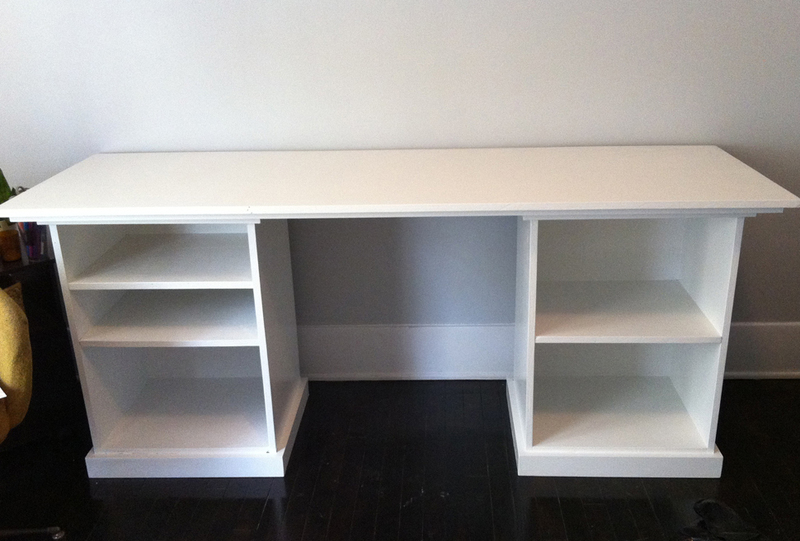 The cabinets are built, there is a desktop and it has all been primed and painted. I have been actually using it in my office. It is, however, still missing the drawers. Many people have looked at it and said, “Why do you need drawers? Just put some baskets in there.” Baskets are a good alternative to drawers, but I had my heart SET on drawers…two filing drawers and two smaller drawers for common desk supplies (and junk – because, let’s face it, I know how to junk up a perfectly clean space in no time flat). Now as I hang my head in shame after admitting that to the world wide web (and while my family nods their head in agreement), you can understand why I want NEED drawers. I hate to admit it, but I am still not done. I built the first drawer three times. After I had the first drawer put together and drawer slides attached, I pushed it in. And I pushed it in. I said, “I pushed it in!! !” You get the point. It didn’t go in. And then it didn’t want to come out. I was frustrated. I was sweating. And then I cried. I had built a drawer that didn’t work. I texted my dad and told him of my failure. He was still proud of me. I happened I be going home that weekend so on Thursday I packed that filing cabinet in the car with my materials. He gave me some pointers, but we didn’t get a single drawer finished. But I had a new hope after that weekend. That was February 25th. 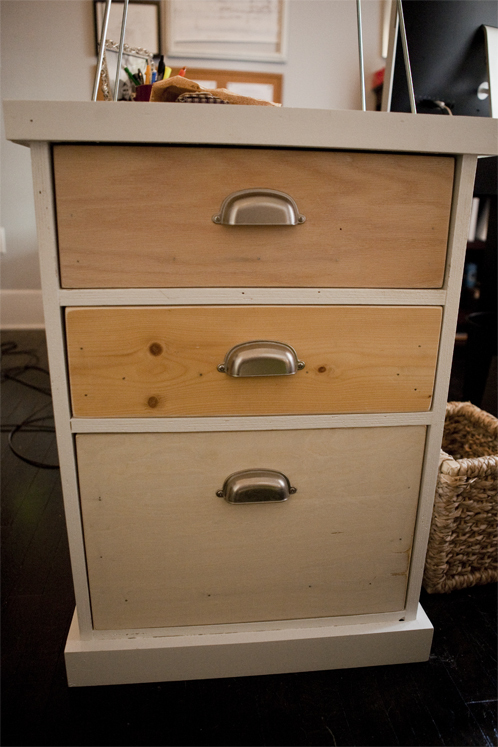 That next week I finished three out of four drawers. They aren’t painted yet, but you can see the progress. I know I speak for both of us when I say I cannot wait for this desk project to be complete. Here’s hoping for a productive week! P.S. Just incase you are interested, the plans for the desk and filing cabinets can be found at Ana-White.com. If you peruse the site and find a project you want to built, I strongly advise you to read through all of the comments on that particular project. The plans are great, but not perfect, and I have found that it is better to take the plans as a starting off point. Everything I have built from this site has been modified in some way to make it exactly how I want it. Please also note that some of the plans might have errors. If so, those are generally addressed in the comment section. But with any building project, think through it carefully. Measure twice, cut once! 2-Chip says you can come over and do all the house projects he’s supposed to do… ha! I am seriously proud of you. And BEYOND impressed. Drawers scare the crud out of me too. I’m thinking of building a farm table from some plans at Ana White. My pastor is the son of a carpenter and has good tools, so he’s going to help me. I’ll let you know how it goes. 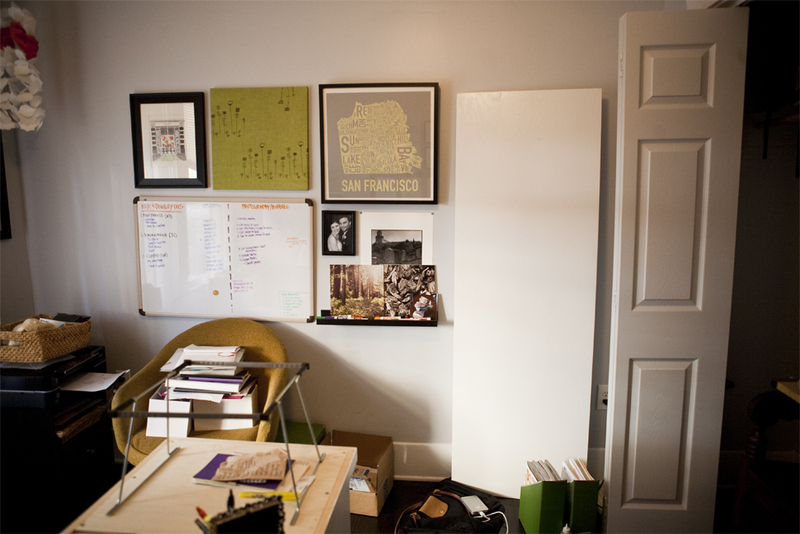 I think the desk with no drawers was already beautiful, and now it is going to be beautiful AND practical. Best combination ever!